HOWDY Friends! It's Ray here with my super exciting RECAP of the Launch Event I attended this past Tuesday for V.E. 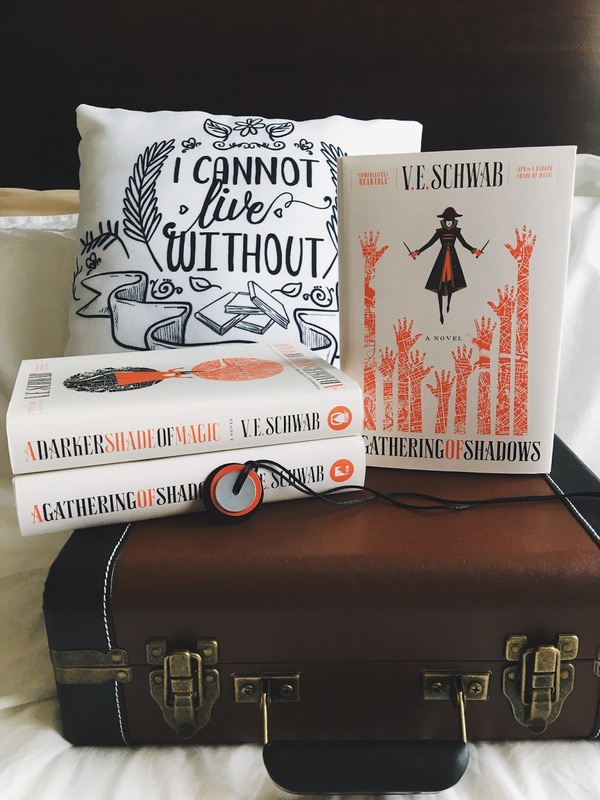 Schwab's latest adventure, A GATHERING OF SHADOWS - Evie has put together something extra special for you all, a giveaway centered around AGoS in celebration of it's release! Details on how to enter will be at the end of this post, make sure you check it out, I guarantee you wont want to miss out! 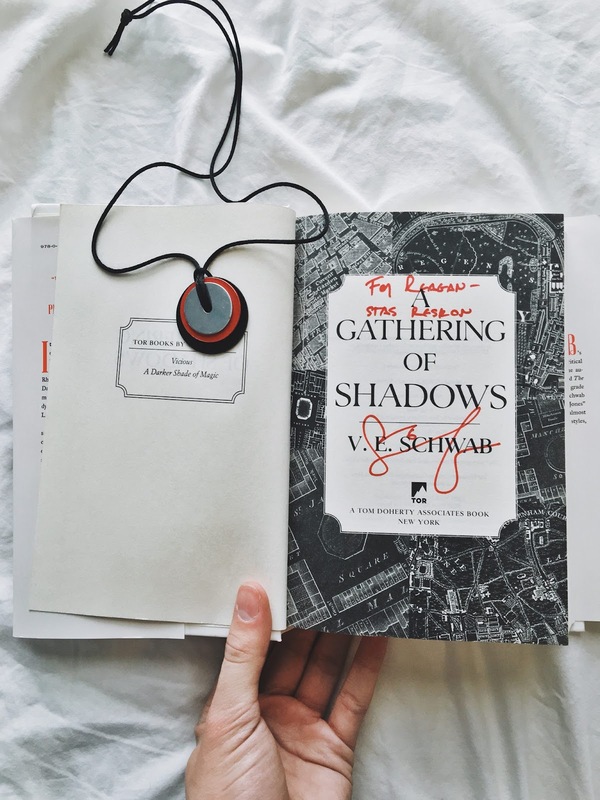 Tuesday, February 23rd I attended the official Launch Event and start of the Book Tour for A GATHERING OF SHADOWS. Let. Me. Tell. You. This was a HUGE day - not only for fans of the “Shades of Magic” series but for me personally since V.E. Schwab is one of my favorite authors. Obviously this is already a reason for me to freak out, being a huge fan of the series myself, I was ecstatic when I was given the opportunity to meet Victoria, as well as sit in on a very inspiring Q&A session between her amazingly witty editor Miriam, Victoria herself, and of-course her fans. 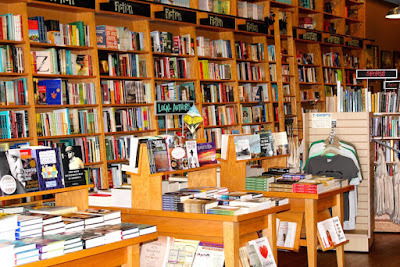 The event was held at the cutest independently owned bookstore – Parnassus Books. (seriously if you're ever in Nashville you have GOT to stop in and say hello) The staff and every employee there were extremely kind, helpful, and did I mention they have a plethora of furry friends? There were at least three sweet, and very cute puppies guiding me along the shelves. Each display and bookshelf was organized by genre and arranged very neatly, with associates on sliding ladders carefully gliding past. Little fact: in Greek Mythology, Mount Parnassus was a source of inspiration and the home of literature, definitely an appropriate name for a bookstore am I right? After our initial conversation, Miriam took questions from fans in the audience. There were so many wonderfully thought out questions, a few of which stuck with me: “What are you currently reading?” - “What was your inspiration for the story?” - “Which character from AGoS was your favorite to write? Which was your favorite to read?” - “Do you have any advice for young, aspiring authors?”. Victoria of-course had a perfect answer for each and every one. If I could pick one bit of advice that V left with us, it would be for anyone who has ever sat in front of a blank screen, banging your head against the keys. The advice is this: “You cannot fix a blank page. The best thing you could do is FINISH the book. Get to the END. The story then becomes your clay at the potter's wheel. It's an empowering feeling.” This really hit home for me, as I have found myself staring at a blank screen with an equally blank mind more times than I can count. As soon as we got into the car after the event, I called one of my close friends who has actually been writing her very own book for the past 17 years. 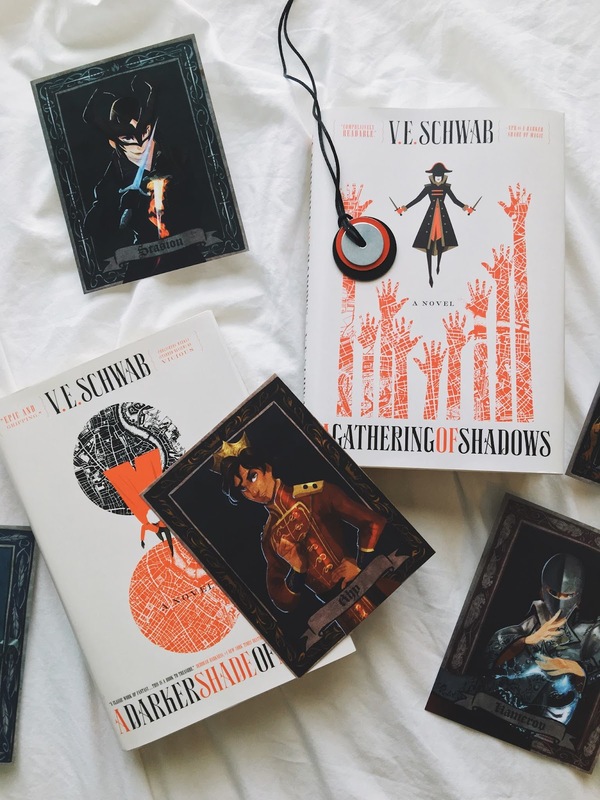 Schwab told us all about the discovery of a phase that every author goes through at some point during the writing process, one that involves a mental/emotional breakdown following the slaughter of every character in your book. I can definitely see the importance of having a supportive friend as an editor, who is not afraid to tell you that a.) you're losing it, b.) everything is going to be okay, and c.) it's not necessary to kill off 25 characters in the last few chapters. I have a feeling that George R.R. Martin is just frozen in this phase, and his editors just have to roll with it. The transition process from Q & A to Book Signing was handled flawlessly. The Children's Book Manager at Parnassus had the floor, and she laid out a few ground rules to follow as they prepare for the next phase of the evening. In minutes, we had a neat line formed to have our books signed, and meet Victoria. 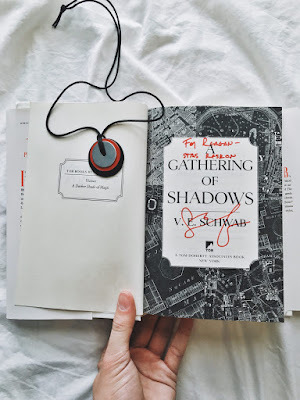 As soon as it was my turn, with my newly purchased copy of A GATHERING OF SHADOWS in hand, I approached the signing table. 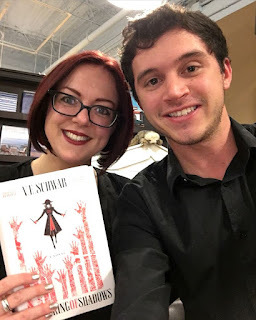 (low key already feeling my face turning red, all of the nerves from this evening attacking at once) Victoria was the sweetest, most humble author that I have ever had the pleasure of meeting. She immediately recognized my name and commented that we had been chatting on Twitter over the past few days. Victoria's books, both ADSoM and Vicious, were the inspiration behind starting my Bookstagram account and I told her that because of this fact, I now had over 6,000 friends all over the world in which I could fanboy with, about her books. Her books introduced me to something that is so much more than an application on my phone, iPad, and computer. Bookstagram is a community of friends, who have come together in the spirit and love of READING. 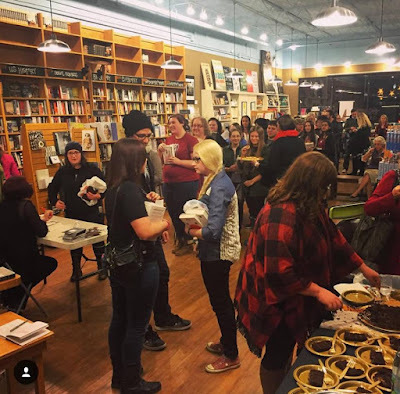 Each and every person I have met through Bookstagram is someone that I would do any and everything for in my power. I even met Evie through Bookstagram! Needless to say, I would not be in the position I am today without it. We chatted about our mutual love for BookTube and Bookstagram, and you know I wouldn't leave without snapping a photo of us both for – you guessed it, my favorite App. A few final things that truly made me feel the passion that went into this event were the beautifully decorated chocolate cake, the dozens of red roses adorning each table, and my personal favorites - the “Shades of London” necklaces and the Reader Signature Book. Victoria has a special book that she is bringing with her to every tour stop, so that when she signs YOUR book, you can also sign hers! How sweet is that?? (pretty sure the book is labeled “evil plots and other stuff”) I signed the first page and with Nashville being the first stop on her book tour, I thought it appropriate to include a Tolkien quote next to my signature, “Home is behind the world ahead.” After a couple conversations with other readers and a slice of that heavenly chocolate cake, I grabbed my special copy of A GATHERING OF SHADOWS and my bag filled with AGoS swag, and began my journey home. Truly I have never felt such a sense of appreciation from an author for her fans. 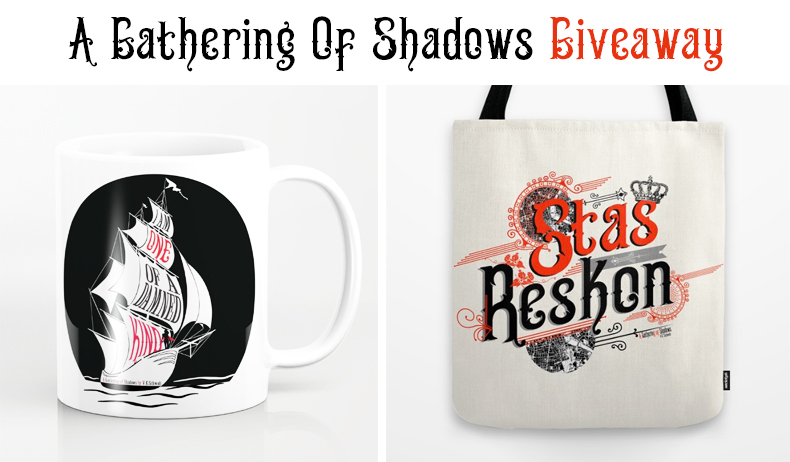 A GATHERING OF SHADOWS Mug and Totes Giveaway by Evie! Rules: International entrants are welcome!